In the Mesozoic era of social networking — that distant year of 2007 — a new community was poised to take over the web, replacing the aging and visually painful MySpace species. Virb allowed users, who joined by invitation only, to craft and customize extremely elegant and sophisticated personal profiles with all the accoutrements of online social behavior. Photos, videos, messages, etc. MySpace died a natural death. Virb, however, was crushed by the imminent rise of Facebook with a nail in the coffin courtesy of Twitter. Acknowledging that they couldn’t compete with Facebook, Virb is re-emerging not as a social tool but as a website-building tool, harnessing the effectiveness of its personalization tools so that photographers can put up a decent portfolio or bands a decent promotional site. The new service also benefits from hosting company Media Temple being the parent company of Virb since 2008. While most companies who didn’t succeed at first would be compelled to change names and launch under a different personality, Virb is betting that its name, in good-standing condition with the web world, can handle the complete switch of service and business model. Our challenge was redesigning a brand already established with a face and reputation as a social network. Virb’s direction and mission — to build elegant and easy websites — led us to develop an identity that is simple and strong, keeping longevity in mind. Brands need to be extensible — to grow and be shaped aesthetically in different formats and presentations, but also to retain flexibility in how they are used when delivering a message, purpose or idea. The old logo was a perfectly acceptable wordmark and could have probably been used in the new Virb, but an effective identity redesign always helps to signal change and that’s exactly what this one, by San Francisco-based Weightshift, does. The visual change is pretty obvious: from extended chunkiness to condensed spryness. 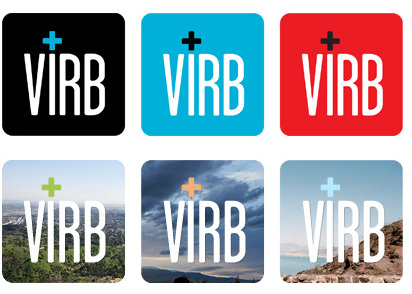 I’m not sure what the dot of the old one meant, but that has been replaced by a vibrant blue plus sign that adds a nice playful element to the logo, and signifies that Virb + You can make sweet design music together. I like the new logo quite a bit, that specific set of characters looks nice condensed and I like the “dirty” joints, makes it a little imperfect. The “V” on its own looks slightly flimsy and fragile, but I like how it keeps the position of the plus sign from where the “I” would and transforms it into a modifier of sorts. Overall, a nice rebrand, but the new market Virb is entering is already flooded with options, hopefully they can thrive and survive this time around. Thanks to Russel Quadros for first tip. In the Mesozoic era of social networking — that distant year of 2007 — a new community was poised to take over the web, replacing the aging and visually painful MySpace species. Virb allowed users, who joined by invitation only, to craft and customize extremely elegant and sophisticated personal profiles with all the accoutrements of online social behavior. Photos, videos, messages, etc. MySpace died a natural death. Virb, however, was crushed by the imminent rise of Facebook with a nail in the coffin courtesy of Twitter. Acknowledging that they couldn't compete with Facebook, Virb is re-emerging not as a social tool but as a website-building tool, harnessing the effectiveness of its personalization tools so that photographers can put up a decent portfolio or bands a decent promotional site. The new service also benefits from hosting company Media Temple being the parent company of Virb since 2008. While most companies who didn't succeed at first would be compelled to change names and launch under a different personality, Virb is betting that its name, in good-standing condition with the web world, can handle the complete switch of service and business model.